We can make serious business and learning awesome. Actually, it’s one of our greatest strengths! Join us as we take professional and personal development out of the “classroom” and unleash the results. Let us immerse you into a transformational travel experience in which you discover, reflect, and apply learnings to your goals. The Prepare to Soar leadership experience leverages the true story of the Apollo 13 Mission and 13 Mission Critical Concepts (MCCs) that drove the Crew’s success. Looking for a transformational program guaranteed to completely reset your perspective, thinking, culture, and team dynamic? S.E.A.L. Training™ is the EBL™ for you. 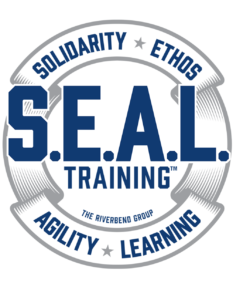 Co-led by both The Riverbend Group and some of our country’s most elite Navy SEALs, this deeply immersive program will give you results …immediately. Prepare to Roar exists to provide you with the inspiration, the tools, and the courage that you are looking for to reinvigorate, accelerate, transition, change or launch your journey professionally or personally.